the underground cistern is kinda crazy. it's so huge and elegant, but it's so deeply underground, to think of it being 1500 years old makes me worry it will all crumble around me... but the arches have been standing this long, i'm sure they'll stay standing till i'm above ground again! 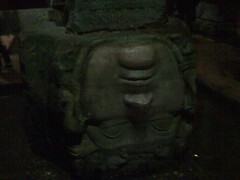 the medusa heads are aparently contriversial. people say they're upside down so they don't turn anyone to stone and the like. i subscribe to the theory that they were just throwing whatever they could find in the basement, and the medusa heads were just the right height.